President Barack Obama waves to the crowd as he and first lady Michelle Obama walk onto the stage, April 27, 2012 in Fort Stewart, Ga. While the political fashionistas had a field day this week with Ann Romney's nearly $1,000 blouse, she is not the only presidential candidates' wife with expensive taste. Despite her penchant for more affordable clothing, first lady Michelle Obama also has a pricey wardrobe. From Balenciaga and Helmut Lang to Michael Kors and Marchesa, the first lady has been known to wear some big-name, and expensive, designer fashions. Last week alone, Mrs. Obama was spotted in two different L'Wren Scott cardigans, priced between $2,000 and $3,000. Last Thursday, Mrs. Obama wore the designer's peach embroidered cardigan to a Take Your Child to Work Day event at the White House. The very next day she wore another, similar version in white with red embellishment to greet troops at Fort Stewart with the president. It should be noted, however, that Mrs. Obama is also well-known for boosting sales at the more affordable J. Crew and has been seen shopping at the discount store Target. Mrs. Romney's decision to wear Reed Krakoff's silk bird-printed design on morning television raised eyebrows earlier this week. The blouse retails for $990. With the state of the economy a key campaign theme for their husbands, both women's fashion choices will likely be heavily scrutinized in the run-up to election day. Mrs. Obama is familiar with the public tweaking for her pricey choices. During her Hawaiian vacation last December, the first lady was spotted wearing an almost $2,000 sundress by designer Sophie Theallet to church on Christmas day. 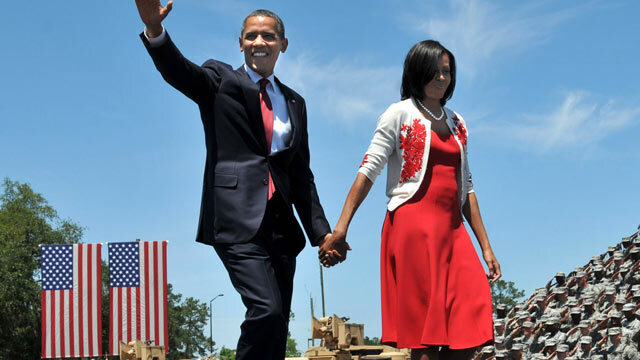 Later, she reportedly donned a $950 Comme des Garcons skirt for a visit with troops and their families. For more Michelle Obama fashion, go HERE.